To wash your Vette, first, think shade, water supply and equipment. Don't do it in the sun. The heat causes rapid drying during the soap step and makes big-time water spots. Inadequate water flow is inefficient and definitely annoying so, fairly high pressure is desired. Problem is: many residential plumbing systems are pressure-regulated to keep toilet valves from hanging open, so best car washing comes when you have one water source at "street pressure", i.e. : it connects to your water service after the meter but before a regulator. 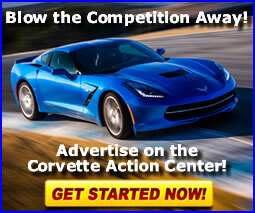 "To wash your Vette, first, think shade, water supply and equipment." You need good spray. 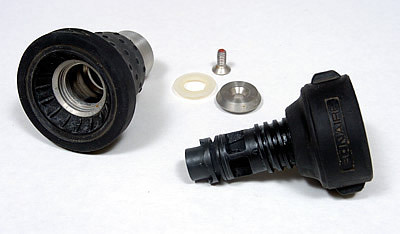 Great for washing cars are "firehose" nozzles which attach to garden hose connections and which you twist to turn on, turn off or to control spray. Introduced back in 2001, such devices are made by Bon-Aire Industries of Boise, Idaho. Clearly, the inventor and company owner, one Robert Bonzer, was inspired by nozzles used in firefighting. 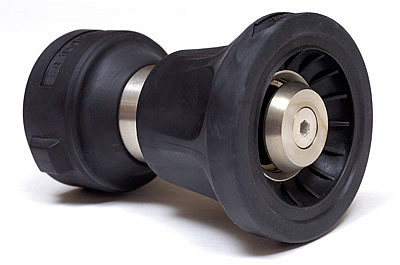 Bon-Aire's "Ultimate Hose Nozzle" is available in either lightweight aluminum or stainless steel. They can be found for as little as 17 bucks for aluminum and 30 bucks for stainless. We use an Ultimate Stainless Steel Hose Nozzle which we found at: (well...duh) ultimatehosenozzle.com, but there are many sources for Bon-Aires. Nothing like street pressure and killer spray to give your Vette a bath. 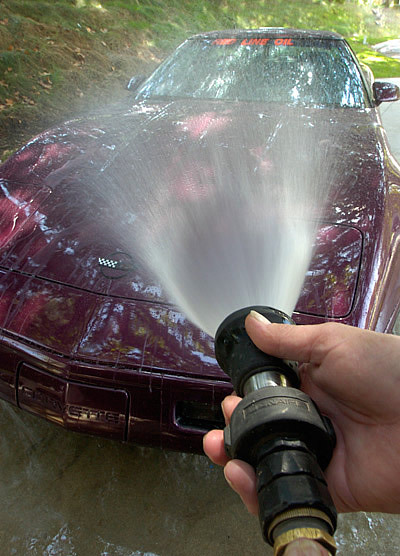 Here we're using our ten-year old, Bon-Aire "Ultimate Stainless Steel Hose Nozzle" to wet down a ZR-1. After a decade, it still works great. The Bon-Aire Ultimate Stainless Steel Hose Nozzle was inspired by fire fighting equipment. It's sprays in a wide pattern or a tight stream. You twist the outer ring to turn it on or to change the spray. It turns off in either direction. We've had one Bon-Aire in service since 2001. One nice thing is they can be quickly disassembled for cleaning or maintenance which we did for this picture. Clearly our unit is in very good condition after six-years of rough treatment. We dabbed a little silicon grease on the threads, put it back together and stuck it back on the shop's hose. 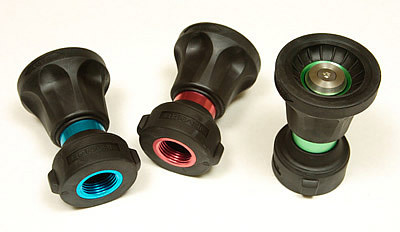 Bon-Aire also makes a lightweight aluminum version of the Ultimate Nozzle and they come in three "designer" colors. There are firehose nozzles which are more costly--you can even go to fire service supply houses and get the real thing at an obscenely high price--but functionally, you won't get any better results from them in car wash duty. Obviously, there are Chinese-made "knock-offs", too, which sell for as little as ten bucks. Yep, they're half the price of the good stuff, but they may break in normal use, whereas you'd have to take a freakin' sledge hammer to a Bon-Aire to bust it. If you want to pay more, for no additional benefit, or less, for questionable reliability/durability, knock yourself out, but the best value for a Corvetter is the Ultimate Hose Nozzle. Our stainless unit has been in-service for six years. It's been dropped--even thrown, on the ground--maybe a thousand times or more but it still sprays perfectly and doesn't leak. It's been dragged along the driveway a distance that must be a few mile or so by now, but the rubber exterior coating has protected the nozzle and shows little wear. Clearly, you buy a Bon-Aire and you have a nozzle for life. You need a good wash bucket--at minimum, one of the "standard" 3.5- or 5-gal., plastic pails used to store paint, chemicals or lubricants. The reason these are best is because their lower diameter fits a ingenious product called "Grit Guard" which you set on the bottom of the bucket. A source of scratches in your Corvette's paint is contamination your sponge, wash rag, mitt or whatever, picks up from the wash water near the bottom of the bucket. A Grit Guard is a combination grate and baffle which provides a grating surface above the bucket floor on which to rest your sponge but leaves 2.5 inches below it to contain any dirt and keep the sponge from touching it. The baffles reduce turbulence or swirling which might stir up dirt you'd rather stays under it. 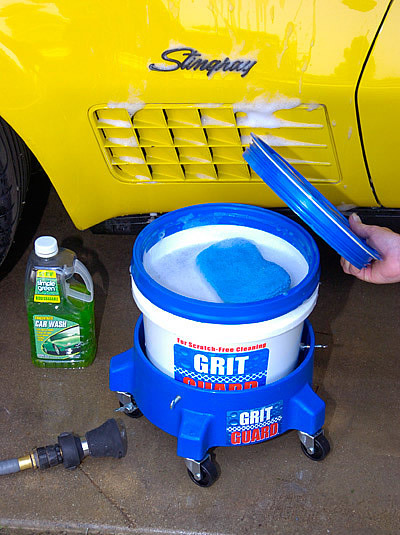 Our wash rig is Grit Guard's "Washing System", consisting of a Grit Guard in a specific 3.5-gal. bucket, mounted in a five-wheel dolly. The dolly makes moving the bucket around easier and its five wheels are a smart idea because, when crossing a seam in garage floor or driveway, two wheels can't line up and tip the bucket. 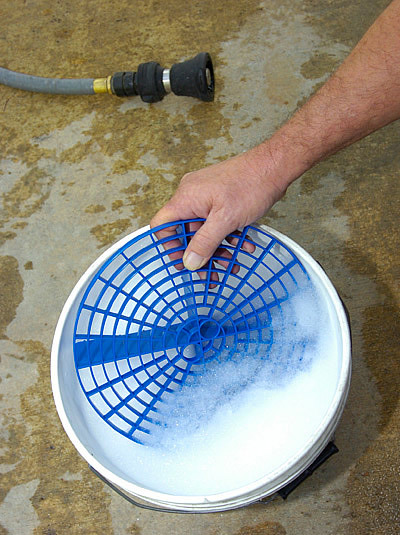 When not being used to wash cars, the Washing System is topped with a "Gamma Seal Lid", when screwed in place, provides leak-proof cover so, the bucket doubles as a clean storage container for wash gear. Last but not least, when I'm drying or polishing the sides of the car, I can sit on the Washing System's top cushion. I tell ya, for a lazy, non-waxer, it doesn't get any better than that. Uh, well...maybe it needs a little hang-on drink holder for my beer. We found the Grit-Guard at the SEMA trade show several years ago but didn't get around to testing one until this article but what a great product it is. The idea--keeping the sponge, wash mitt or whatever, above the level of dirt which drops into the wash bucket--is a big "Well...duh!" A Girt Guard is engineered to aid in releasing dirt from your wash device. Rub it across the Grit Guard and the device's radial design helps release trapped particles which settle through the insert and into the bottom of the bucket. The Grit Guards baffles reduce turbulence which might keep the dirt in suspension. The Grit Guard people sell bundle of their products called a "Washing System". The best part of which (besides the Grit Guard inside it) is the five-roller dolly. It makes moving the bucket around the car easy and, once you screw on the top, give you a place to sit. Now, decide what the goal of your car washing will be. If you want to wash the car to strip it of wax or polish, use cold or warm water and dishwashing detergent. We like Dawn but others work well too. We usually add two ounces of Dawn to a couple gallons of water. If you're not going to strip the wax, then you need to use something which won't remove waxes or polishes. In a technical sense, this must be something with a relatively neutral pH. Generally, that describes many "car wash" products. C-Magic makes an excellent car wash which was formulated specifically for washing Corvettes to be polished with its World Class Wax. It's a contrarian formula which is low-sudsing. The reason for that is, as C-Magic's Kermit Dye told us, "We found a low suds approach is more easily controlled. While extreme suds offered a good feeling, we found we had to be careful to rinse thoroughly while continuing to keep the vehicle wet during the wash cycle where as the low suds allow you to better view the progress of your wash as you work. Our Wash has chemical additives which buffer the surface being washed from scratches. It also keeps the surface wet while you continue to wash without water spotting." Another good choice, and what we normally use, is "Simple Green Car Wash" which won't strip wax and has a cost-per-unit lower than some other products. In addition, like all Simple Green products, Car Wash is biodegradable, that is, when you're done with the wash water, you can dump it on your lawn and not worry about killing the grass. We put 2-3-oz. of Car Wash in the Washing System bucket then fill it until the suds just about overflow.